Figure 1. 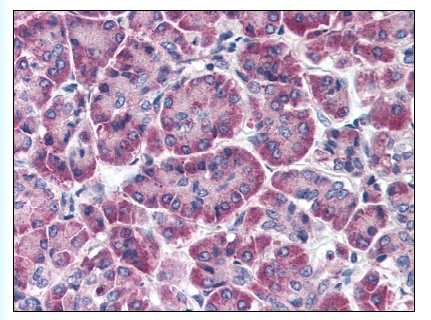 Formalin-Fixed Paraffin-Embedded (FFPE) on Pancreas. Western Blot analysis of FBXO9 expression in transfected 293T cell line (H00026268-T01) by FBXO9 MaxPab polyclonal antibody.Lane 1: FBXO9 transfected lysate(48.07 KDa).Lane 2: Non-transfected lysate. 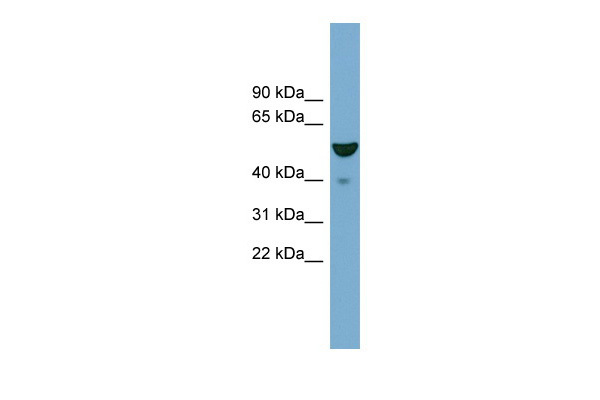 Western blot using FBXO9 polyclonal antibody ( Cat # PAB10012 ) shows detection of a band at ~100 kDa ( arrowhead ) believed to correspond to FBOX9 present in a MCF-7 whole cell lysate ( lane 1 ).Specific band reactivity is greatly diminished when theantibody is pre-incubated with the immunizing peptide ( data not shown ).Approximately 35 µg of lysate was separated by 4-20% Tris Glycine SDS-PAGE.After blocking, the membrane was probed overnight at 4°C with the primary antibody diluted to 1 : 1,500.The membrane was washed and reacted with a 1 : 10,000 dilution of IRDyeTM800 conjugated Gt-a-Rabbit IgG [H&L] for 45 min at room temperature ( 800 nm channel, green ).Molecular weight estimation was made by comparison to prestained MW markers ( indicated at left, 700 nm channel, red ).IRDyeTM800 fluorescence image was captured usingthe Odyssey® Infrared Imaging System developed by LI-COR.IRDye is a trademark of LI-COR, Inc.
Western blot using affinity purified anti-FBOX9 antibody shows detection of a band at ~100 kDa (arrowhead) believed to correspond to FBOX9 present in a MCF7 whole cell lysate (lane 1). Specific band reactivity is greatly diminished when the antibody is pre-incubated with the immunizing peptide (data not shown). Approximately 35 µg of lysate was separated by 4-20% Tris Glycine SDS-PAGE. After blocking, the membrane was probed overnight at 4°C with the primary antibody diluted to 1:1,500. 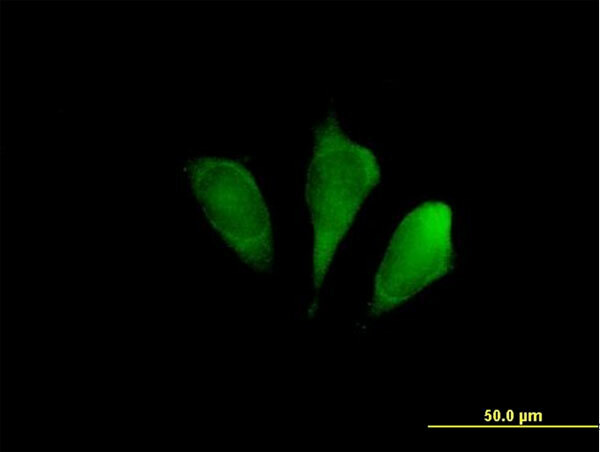 The membrane was washed and reacted with a 1:10,000 dilution of IRDye(TM)800 conjugated Gt-a-Rabbit IgG [H&L] for 45 min at room temperature (800 nm channel, green). 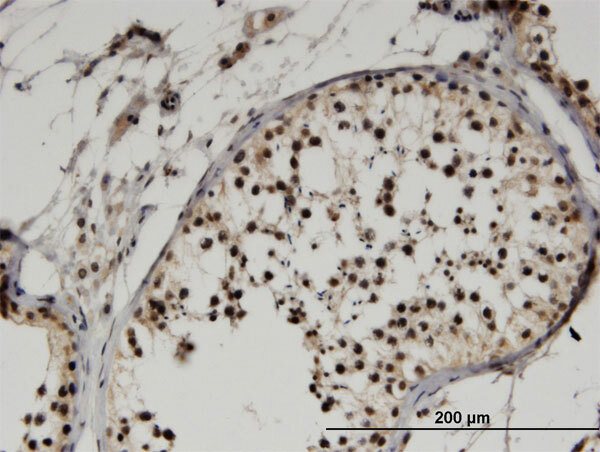 Molecular weight estimation was made by comparison to prestained MW markers (indicated at left, 700 nm channel, red). IRDye (TM)800 fluorescence image was captured using the Odyssey(R) Infrared Imaging System developed by LI-COR. IRDye is a trademark of LI-COR, Inc. Other detection systems will yield similar results.